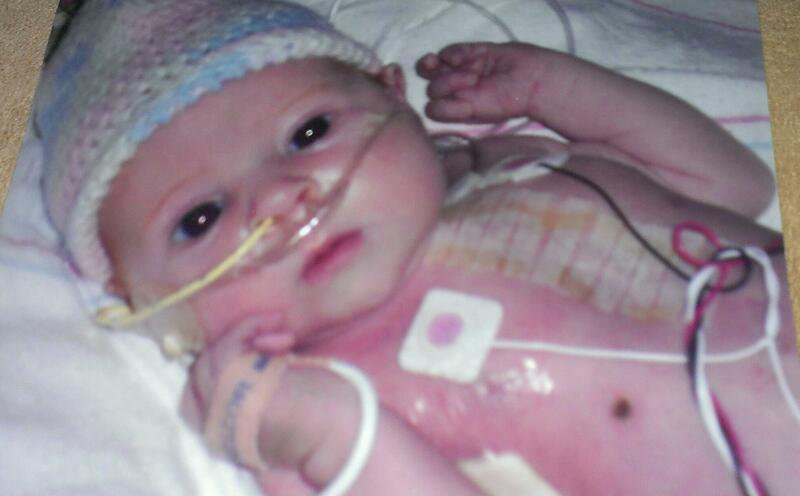 When a mom -to-be receives a CHD diagnosis for her baby, questions and uncertainty swirl. 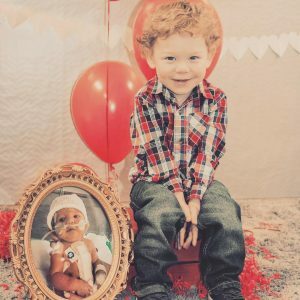 Laura Carpenter shares, this week, how her baby’s Truncus Arteriosus diagnosis affected her perspective on baby showers. I remember reading an advice column many years ago. Someone was seeking guidance about her struggle to attend a friends baby shower after a pregnancy loss. I remember thinking that was selfish of her to not attend and probably only fed her grief. Oh how time and life experiences round the rough edges. I am now the one who hesitates at the thought of attending baby showers, even as I’m most genuinely excited for babies-on-the-way. Sometimes I accept the invitations and I attend. 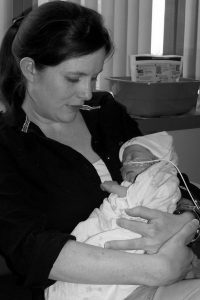 Other-times I forgive myself and excuse myself.Gwenyth, my heart baby was born with a heart defect called Truncus Arteriosus on St. Patricks day in 2010. She passed away when she was two months old. Baby showers are hard for me now. When I do attend baby showers, it’s not just the absence of my baby that can be magnified, it’s the memory of the baby shower that I didn’t have, that often summons the ever present heartache to the surface. If I could do things over again (how often I tread this path in my mind) I imagine the baby shower I wish had for Gwen. 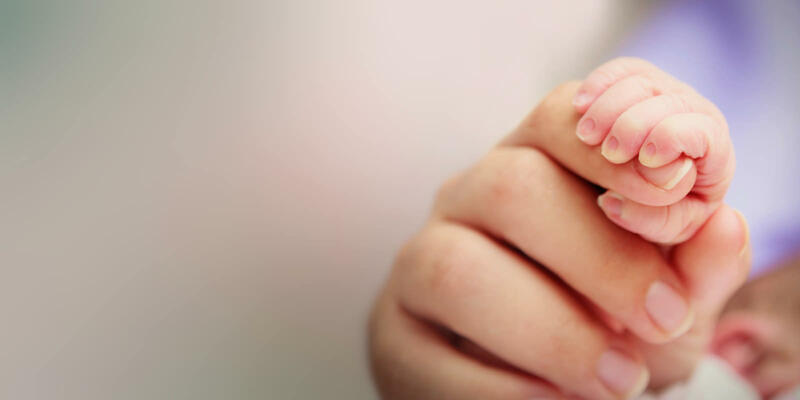 If I could do it over again…I would say YES when my friend offered to plan a shower instead of deciding it was awkward to ask people to attend a celebratory event when her survival to birth was uncertain. I would decide to celebrate her life as given – her life as it was, already deeply a part of ours and Gwen already much-loved in our hearts. However, I would not want anyone to pretend everything was okay – but rather to be there with me, to be present and allowing for all the range of emotions that may come at such “type” of a of baby shower. They could be there to witness her story unfolding and her life as given. They would be part of her life story.If I could do it over again…I would use her baby shower as an opportunity to share the details of her diagnosis and begin spreading CHD awareness then and there (this is my hind-site 20/20 feeding my vision, so of course I’m a well-versed CHD advocate at my HeartBaby shower in this scenario). 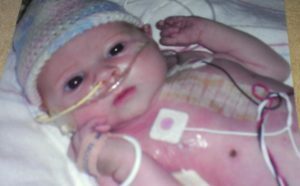 I’d share the stories of new connections I made with other mom’s expecting CHD babies. Everyone would hear about the CHD survivors that live right under our noses and be well aware of the HOPE that exists for heart kids. They would would all leave knowing how underfunded CHD research is and, through my crystal clear, 20-20 hindsight, I’d share a special “HeartBaby Registry” with them which would offer guidance on the “baby stuff” needs of a heat parent. This special list would help everyone know which baby items would be most useful for hospital life. They would serve to bring a little sunshine and warmth to some of the lonely times caring for a baby in the hospital as I would remember the shower and think about the person who gifted it to us and was rooting for Gwen. From the unfair vantage point of hind-sight, I wish I had told my friend, YES, please plan a shower. The reality is, my family and friends would have been honored to celebrate Gwen with me, even it was a different kind of baby shower, perhaps a little more heavy and less light and giggly than most. And what’s more – it would have given us one more very special memory of her life to cherish. 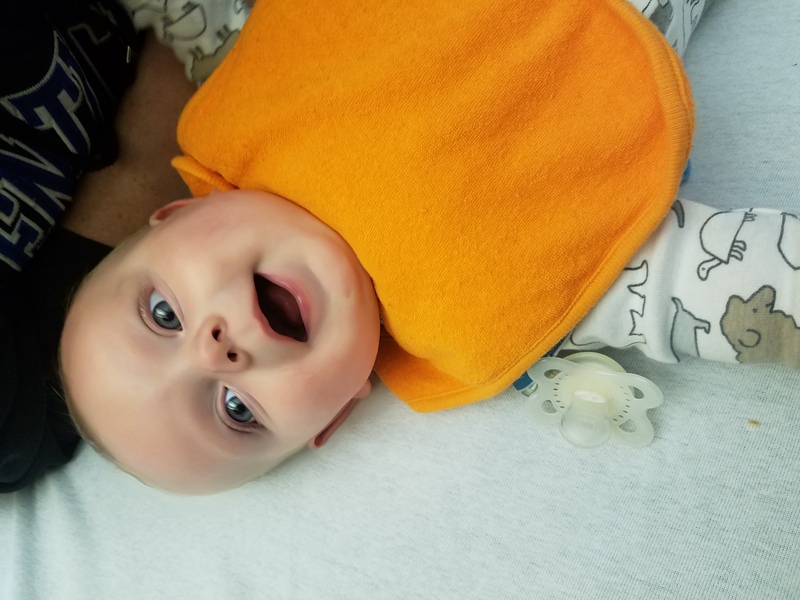 My volunteer work within PCHA Virginia this past year has centered around completing our prenatal care package for families like mine, who learn their baby will need open heart surgery early in life. 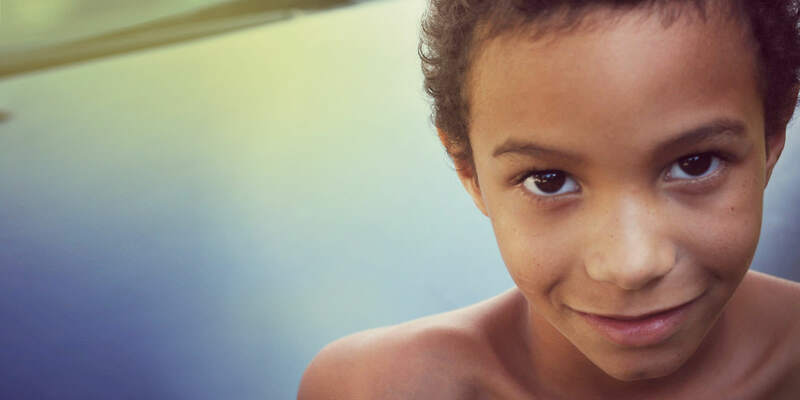 In this “Conquering CHD kit,” PCHA offers guidance for parents regarding what questions to ask their care team, directs them to trusted sources online and shares stories of CHD Warriors that inspire HOPE. There is also a special page, created partly in response to my relentless hindsight about a missed baby shower. With anecdotes and lists, the page offers suggestions on what to pack for the anticipated hospital stay. I hope it will help families get a confidence-boosting glimpse of what caring for a heart baby in the hospital looks like. And, with this in hand, I sincerely hope families facing a prenatal diagnosis will embrace the opportunity to have a baby shower for their heart child and will even find themselves having fun creating their registry, feeling empowered as they know exactly what to ask for as Heart Parents! 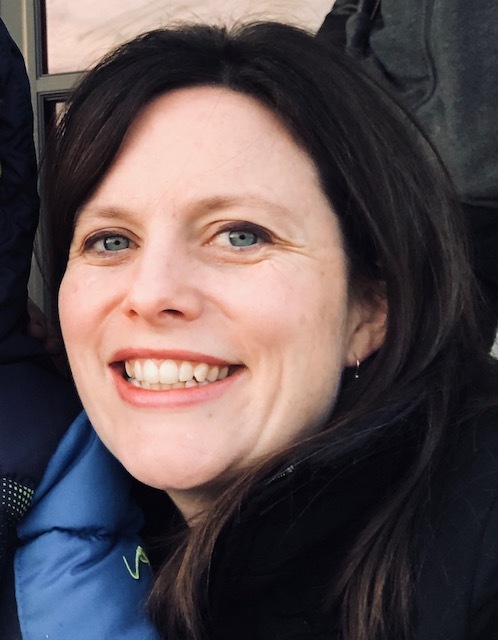 Laura, originally from the Hudson Valley area of New York, lives in Harrisonburg, Virginia where she met her husband, Myers when they were undergrads at James Madison University. Their heart-healthy kiddos are Lillian and Arthur. 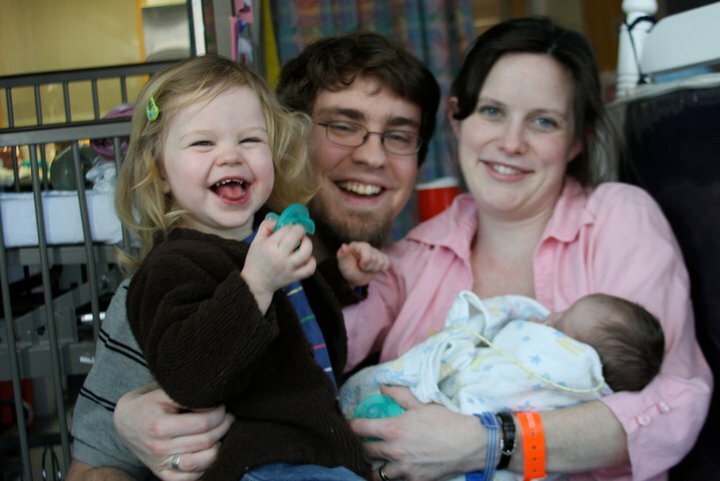 Their middle child, Gwenyth was diagnosed prenatally with Truncus Arteriosus. 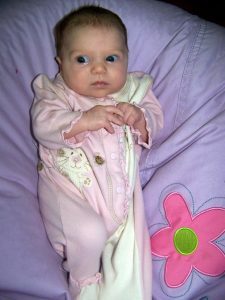 She was born in March, 2010 and had open heart surgery when she was two days old. After about one month of enjoying life at home Gwen passed away from a sudden overwhelming sepsis (Neonatal Alloimmune Neutropenia is suspected in her sudden illness.) 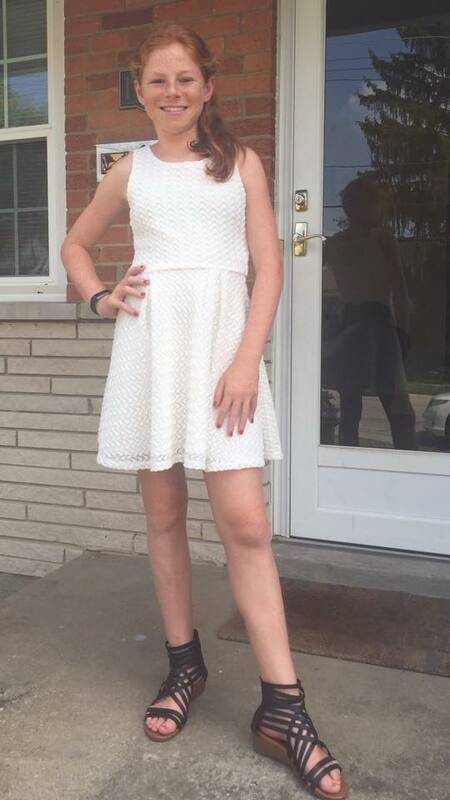 Gwen’s life has inspired Laura to stay involved with the CHD community. She is the President of the the Virginia chapter of the Pediatric Congenital Heart Association and is passionate about helping parents find strength for this journey, confidence in their role as their child’s advocate and connection with other CHD families for invaluable sources encouragement and education. She teaches art part-time at a small private school and enjoys gardening, hiking and spending quality time with friends and family. We continue the New Diagnosis series with Mary Beth Meyers’ story. 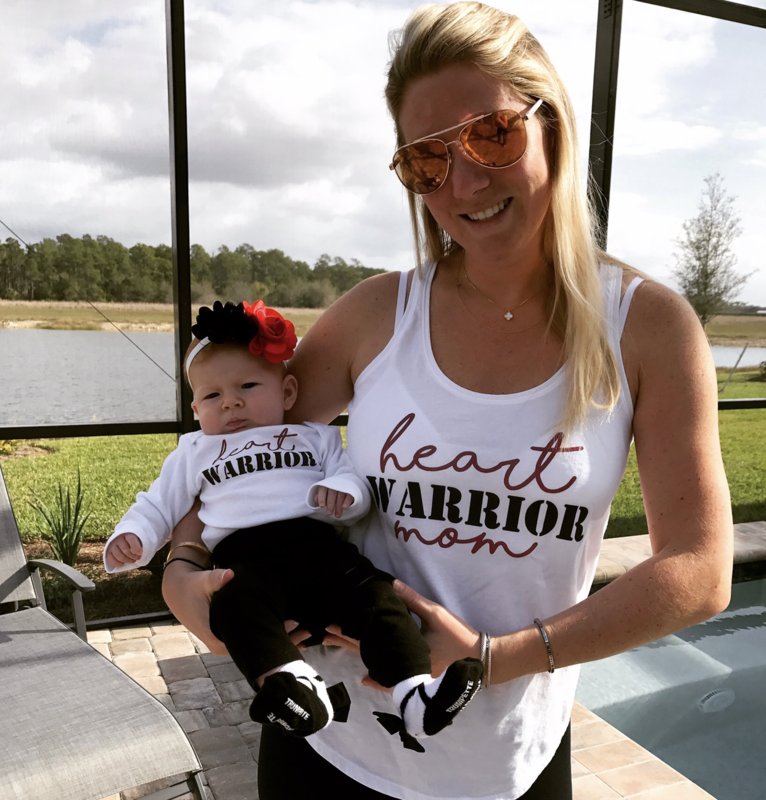 Diagnosed at the age of 23, Mary Beth shares how she had to put her dreams on hold due to an undetected CHD. In May of 2012, I was a newly graduated young woman, with hopes and dreams to begin working with children, meet my husband, and have a family someday. All that came crashing down the day I was diagnosed with a heart defect. A few months after turning 23, having just earned a degree in Early Childhood Education, I learned that I was born with an undiagnosed Congenital Heart Defect(CHD). My specific CHD is an Atrioventricular Canal defect, which isn’t just one, but rather a group of small defects that include an ASD, a VSD and possible abnormalities of the AV valves(mitral and tricuspid). Since this defect can only be repaired by surgery, I am now a two time open heart surgery survivor. I had my 1st surgery in August 2012 and a full mitral valve replacement in May of 2015(pig valve). I will be facing my third open heart this coming Summer. Every since that sucky diagnosis day, life has been an absolute roller coaster ride. One filled with many fears, unknowns, and blessings. The physical, mental, and financial aspect has been draining, not just on me, but family, especially my parents. I know my parents would blow through their savings and sell everything they owned to keep me alive, but as an adult patient, who is quite aware of how stressful finances can be, there is always that sense of guilt running through my mind. I have to remind myself everyday to count my blessings and that somehow God provides, not just for me, but for my parents too. Being a late diagnosis has it’s pros and cons. My childhood was thankfully a normal one, even though knowing about my CHD would have explained all those years of being “tired,” rather than writing them off as laziness. My childhood wasn’t filled with surgeries, multiple hospital stays, doctors appointments, and trauma of not being able to communicate or understand what was going on. For me, however, the cons outweigh the pros. Not knowing for so long your heart was in overload for the majority of your childhood and all of your teenage years can add up to some hefty damage. Sometimes waiting can do more harm than good. And in my case, I, along with my parents and care team, wonder if doctors had intervened early on, would I be facing my third open heart surgery in under 6 years. Unfortunately, that’s something we will never find out, but I firmly believe, the earlier intervention, the better the outcome. Of course, it’s not something to dwell on, but rather be grateful that my diagnosis was found in my early twenties, rather than my fifties, or worse, during an autopsy. 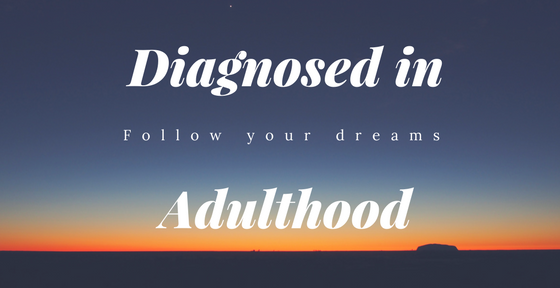 Trying to become a young adult after getting through my 1st surgery has been anything but easy. Open heart surgery changes you physically, mentally, and emotionally. You are not the same person. Trying to navigate through life with something you know will never go away and brings a ton of physical and emotional pain can be draining. Not to mention, it’s financially draining. It forces you and your family to make sacrifices in so many areas. That’s not necessarily a bad thing, but when it consumes your whole life, for the rest of your life, it can seem unfair and downright exhausting. It makes you feel like you don’t know where you belong in this world. All your hopes and dreams keep getting delayed, and you wonder, with another open heart around the corner, if they will actually ever come true. My late heart diagnosis has left me confused, angry, and jealous. Jealous of family and friends building their careers, gaining independence, experiencing marriage and motherhood. The hardest part is realizing, because you survived, that you are here for a reason, yet you feel like a failure. You feel like a failure at times because you are struggling to become the independent adult you thought you’d be since childhood, having no idea then that your defect existed. Even though a few years have passed since my diagnosis, there are still days where it is hard to swallow the news of this disease. But there is a lot I cannot change in my life, I can only keep moving forward with a new perspective. One of my favorite quotes that I’ve come to lean on is, ”Accept the things you cannot change, the courage to change the things you can, and the wisdom to know the difference.” I had no idea this is what my life would become, but everyday is gift. If you find yourself in a similar situation, surround yourself with family, friends, and a community of patients like you. It has shaped me into a person I’d never imagined I would be, and, now, I couldn’t imagine my life any other way. 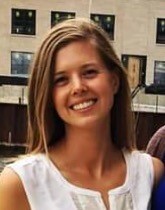 Mary Beth Meyer is a 29 year old, living with an AV Canal Defect. With a late diagnosis at the age of 23, she has since undergone two open heart surgeries. Her most recent was a full Mitral valve replacement. 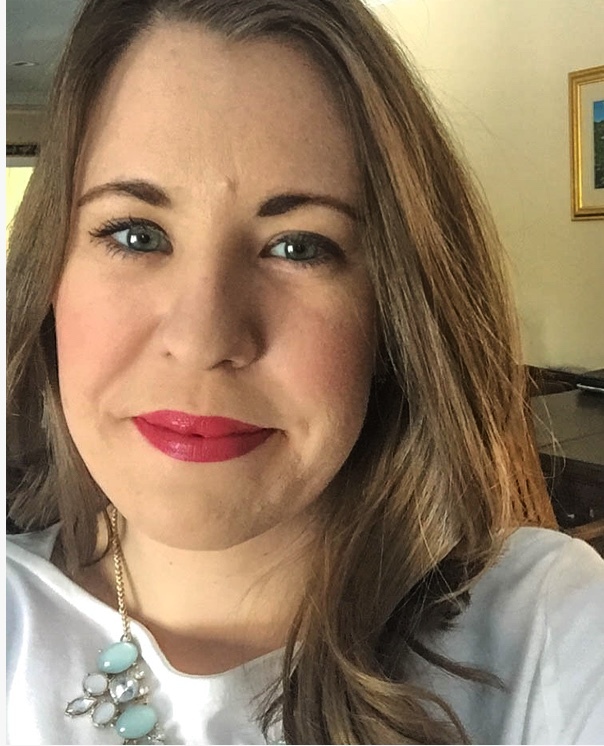 Mary Beth graduated college from Franciscan University in 2011, and is currently pursuing a masters degree in Elementary Education at Holy Family University. She loves being an aunt to two beautiful nieces and a handsome nephew. She loves her faith, family, and a good peppermint latte. 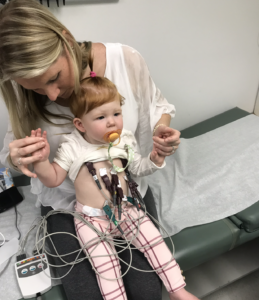 As the author of Mimi’s Open Heart blog, Mary Beth shares the good, bad, and amazing things about having a congenital heart defect. You can find her on Facebook @Mimi’s Open Heart or Instagram @mimisopenheart. 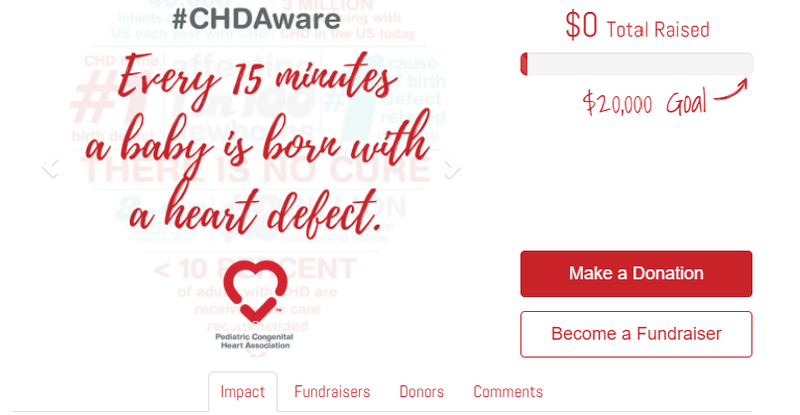 Join our #CHDAware 2018 Fundraising Challenge to support our critical programs that help improve the lives of those living with CHD. We need YOU to help so we can reach our goal of $20,000. All you need to do is register as a fundraiser on our Challenge Page. While the fundraiser will be open all month, much of the activity will be concentrated to CHD Awareness Week. HAPPENING NOW: Launch Day Fun: The first 10 fundraisers who raise $100 after our launch at 8am EST on February 1st will receive a PCHA umbrella. 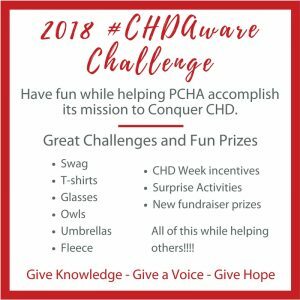 CHD Week Goodness: Every fundraiser who gets at least 10 unique donations of $10 from 8am EST on Feb 7th through 8pm EST on Feb. 14 will get a PCHA Pint Glass! The Whole Shebang: The person who has raised the most money at 8pm CST on February 28 will receive one of each of this month’s prizes. We have a few secret challenges you’ll learn about when they happen, or they wouldn’t be a secret! But one may or may not include a never seen before car sticker!!! 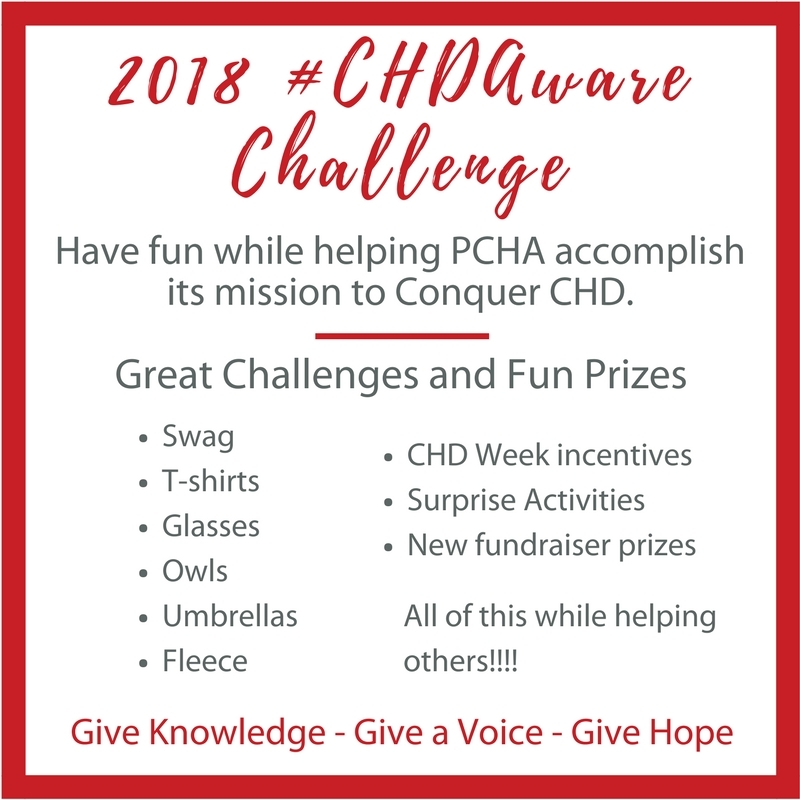 HAPPENING NOW: Lastly, anyone who registers to become a fundraiser and raises $100 or more during the month of February will win an exclusive PCHA t-shirt, designed just for our amazing #CHDAware Challenge fundraisers! Be sure to register as a fundraiser and we will provide you with sample emails, FB posts, tweets, stories, memes, video ideas, and more, to be sure you are successful and bring in all the fun prizes! 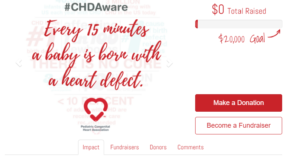 But most importantly, every dollar you raise will benefit people with CHD and their families, whether it is through care packages, policy changes, or important resources. Anyone who donates will be helping to Conquer CHD! 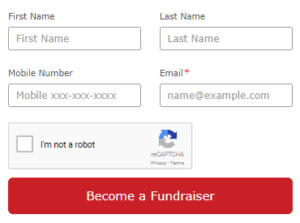 Registering to become a fundraiser takes less than 5 minutes and is as easy as 1, 2, 3! The last step is to personalize your page. Personal message telling people the impact they can have if they give right now. Share your fundraising page through email, social media and even text to get your friends and family involved. As we approach Heart Month PCHA begins its series on New Diagnosis. 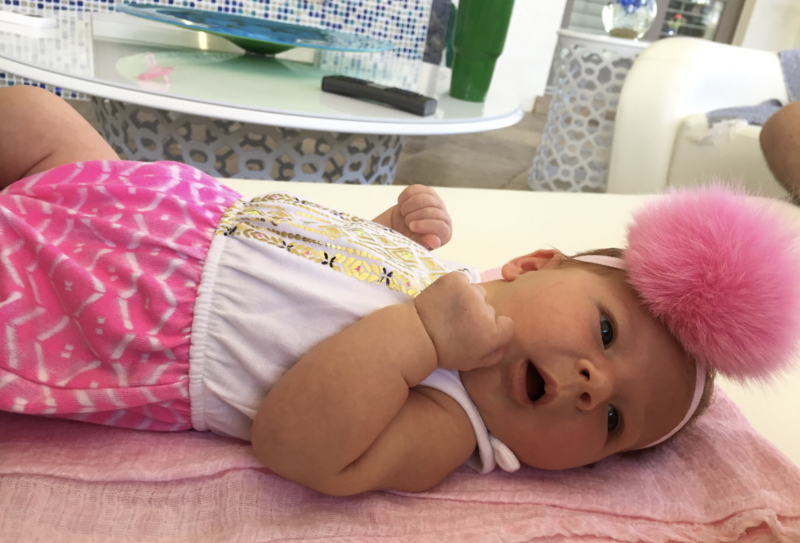 This week, Heart Mom Alexandra Frost shares with us the story of her daughter Emersynn’s diagnosis in utero and how she learned to take the news and life with CHD day by day. It all started when we went for our 12 week NT scan, where they measure the fluid behind the neck. The doctor came into the room and we could feel the discomfort. He said that our baby’s fluid behind the neck was measuring double the norm. This was a red flag for either Down syndrome or a congenital heart defect (CHD). He sent me to get blood work the same day. Ten long days later, I got the results that our baby tested negative for Down syndrome and the other genetic stuff they tested for, and we found out she was a girl! We were so excited and thought we were in the clear since we have no history of CHDs on either side of our family. Fast forward 8 weeks when we went for our 20 week anatomy scan. When the doctor came in, we got that same feeling. She said, “All organs look good, except her heart. Unfortunately, she has a heart defect which puts you in that 1%.” It was one of the worst days of our lives. 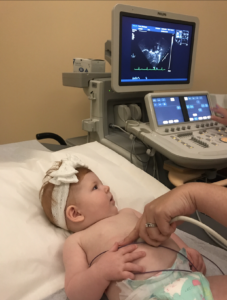 My world shattered as I tried to process these foreign words – “congenital heart defect.” They weren’t quite sure how severe her defect was at that point, which is why we were referred to a high risk OB and then a pediatric cardiologist. 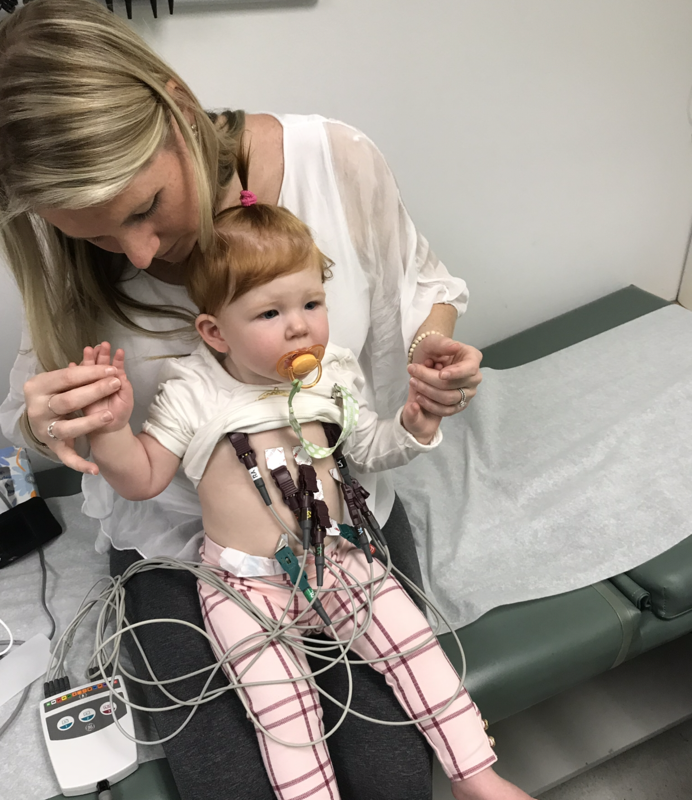 When we saw the pediatric cardiologist, he broke the news that she does indeed have a complex heart defect which is VERY rare. Once again, my heart sank to the floor after hearing this news. Emersynn has congenitally corrected transposition of the great arteries (ccTGA or l-tga), a large ventricular septal defect (VSD), pulmonary stenosis (PS) and dextrocardia. Out of those one percent that end up with a heart defect, .5 – 1% end up with ccTGA. That is how rare the defect is! Only 5,000-10,000 people in the US have this condition! After leaving the cardiologist that day, my husband and I looked at each other in the car and looked back down at the paper that had a drawing of our baby’s heart. 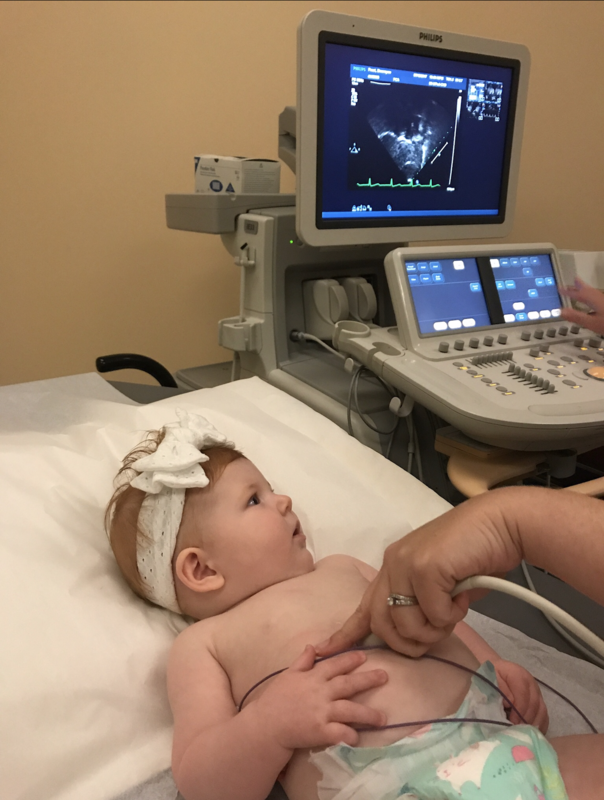 We were so confused and wondered if we would ever be able to understand the anatomy of our little one’s heart. Overwhelmed was an understatement. 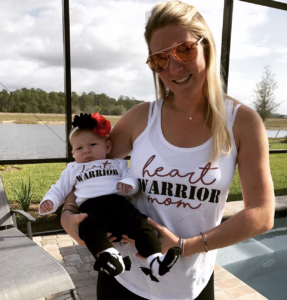 We live in Fort Myers, and, unfortunately, the hospitals around here are not equipped to deliver babies with severe heart defects. We were given the choice to deliver in Miami or Tampa. Although Emersynn’s ped cardiologist (who is exceptional) is in Tampa, we decided to deliver in the Miami area at Memorial Regional Hospital (connected to Joe DiMaggio Children’s Hospital). This decision was made through countless hours of research after finding out (this is how I essentially coped with the news). During our research we came across a Facebook page for a boy that has the same defect. I reached out to his mother who led me to a private Facebook group for Emersynn’s particular defect. Only immediate family or the person affected is allowed to join this group. It turned out to be an extraordinary group that helped us tremendously! We found out, through this group, that a top surgeon for Emersynn’s defect was mentoring at Joe DiMaggio Children’s Hospital, and was there about once per month. This made us feel comfortable, as her defect is so rare and there are only a handful of surgeons that are successful in doing the major surgery that she will eventually need in the future. 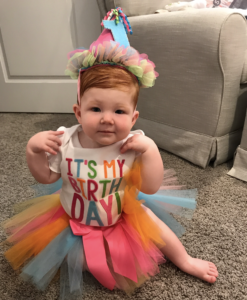 We were told throughout the pregnancy that Emersynn would need a shunt within a week of birth, as they thought she wouldn’t get enough blood to her lungs. She would then need a major surgery called the double switch down the road. I ended up delivering on November 22, 2016 and she was a big baby, which defies odds already! They watched her closely in CICU for three days as her PDA closed. Once it was closed they monitored her saturation. 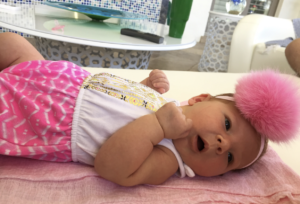 She proved to be miraculous and was sent home on day 4, with no surgery and thriving! 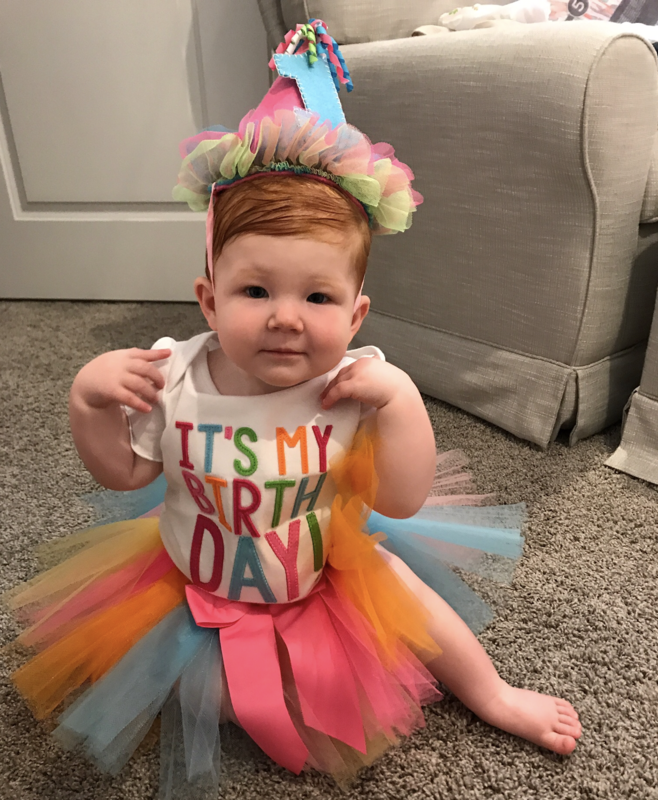 Emersynn just turned one year old and has not had any surgery thus far! She is defying all odds and doing SO amazing! She is growing well and hitting all of her milestones on or before (!) she is supposed to! This little girl amazes us more and more everyday! She is such an inspiration to everyone around her and is such a strong little warrior! Emersynn will need a major open heart surgery in the next few years. The doctors say her body will tell us when it’s time. This is a very risky surgery and hard to put her through when she is currently doing so well. We know she will eventually need this surgery to continue to thrive and give her the best life. Some days, I hardly think about her heart defect, and other days it totally consumes me. It’s something I wouldn’t wish on anyone. However, we wouldn’t change Emersynn for the world. 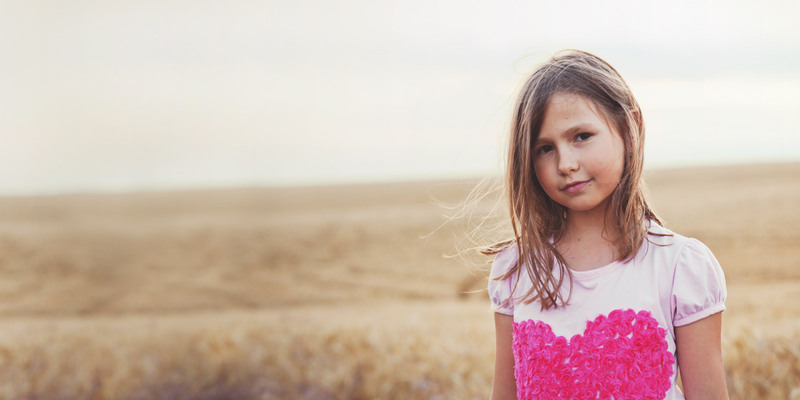 We know that we were chosen to be this sweet girl’s parents, because we could handle the challenge. Through this experience, we have learned to take it one day at a time! Alexandra Frost currently lives in Fort Myers, FL. She is originally from Long Island, NY and graduated from Villanova University in 2012. Alexandra has been married to her high school sweetheart for almost 2 years. She juggles real estate and being a mommy to a very adventurous one year old heart warrior. Alexandra and her husband are excited for their second baby on the way and know Emersynn is going to make a great big sister! Our son Lincoln was born on April 26, 2015 after a very eventful pregnancy. At 24 weeks, we found Lincoln’s CHD, Hypoplastic Left Heart Syndrome, after I developed a placental abruption and a multitude of other complications which put me onto hospital bedrest for the duration of the pregnancy. He was delivered in Louisville, as scheduled, but was so sick he was air lifted to Children’s Hospital of Philadelphia at less than 24 hours old. On his 5th day of life, the first day we were able to hold him, he was taken back for the first of three palliative open heart surgeries in order to survive. He would go on to have his second surgery at 4 months old, and his third at 2 years old. He has had countless MRI’s, echo’s, sedations, heart cath’s, hospital stays, and the slightest illness could mean life or death. Although he is healthy as he can be for his condition, one complication could mean our last resort option…a heart transplant. Lincoln has taught us that no battle is too tough to fight, and he is the reason I advocate passionately for CHD’s. Medical advances have come so far in just a few short years, but there is so much more that needs to be done for these precious warriors who are born having to fight for their lives, for the rest of their lives. Lincoln lives in Kentucky (although we’ll always call Philly our second home), with his parents, and 4 older brothers. Jeremiah was born with a congenital heart defect. We found out at our 18 wk ultrasound that there was something wrong with his little heart. After multiple ultrasounds, many echos, transfer to the UK team, & then another transfer to Cincinnati, we gave birth to our otherwise healthy baby boy on August 4th. He was born with transposition of the great arteries, an ASD & a significantly large VSD, pulmonary stenosis, & a cleft mitral valve. We spent his first 2 wks of life in the cardiac ICU where he underwent two heart cath procedures to allow for adequate mixing of the blood in hopes to carry him over until he was big enough for open heart surgery. Within a month, we were back for an overnight stay at Cincinnati Children’s for a blood transfusion & then again the next month for yet another cath procedure to enlarge the stent that was placed prior near birth. The goal was to beef up this baby to 5kg & when he exceeded that & was doing so well, they raised the goal to 6-7kg. His date was set in Dec to have open heart surgery January 22nd. 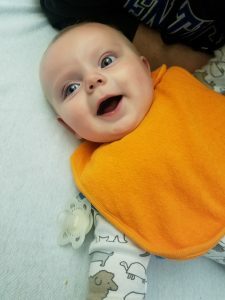 Upon admission to this hospital stay, Jeremiah was 7.5 kg, having exceeded yet another weight goal! His open heart surgery went better than expected! Both cardiologists (in Lexington & Cincinnati) & the cardiothoracic surgeon thought he would have to have a single ventricle repair. We found out during the procedure that the doctor had successfully repaired his heart to two ventricles. Unfortunately, his AV node and SA node would not pick up communication after surgery and after 10 long days of waiting, he went back into the OR for a permanent pacemaker. Jeremiah has a pacemaker implanted into his belly to make sure that his heart functions normally. According to the doctors, this is not a setback nor do I have much negative things to say about it. It’s what his little heart needed. He’ll have just a few limitations but should live an active & healthy life! In the latest post in the Wellness Series, Megan Horsley, heart mom and Pediatric Dietitian at Cincinnati Children’s Hospital Medical Center, discusses how to find balance with your nutrition. Have you ever felt off balance? I am not specifically talking about when you were walking on a balance bean during gym class or gymnastics; or stretching your quadriceps after a run; or learning how to ride a bike for the first time. I am talking about BALANCE as you journey through life. I can assure you, from heart mom to heart mom and heart dad to heart dad, having your child affected by heart disease creates imbalance in your life at times. I think this unevenness, even though challenging in the moments, help us to grow into better individuals in the long run. What about when you ignore your alarm and wake up late, panicking because you have to get to work, an appointment, or make sure the kids make the bus, or let the dog out before he or she pees on the floor. Then like dominos, the rest of your day may seem off. You either eat late, skip eating or choose something half satisfactory and unhealthy and then before you know it, it is dinner time when you stop and think about your eating and drinking choices throughout the day! Well, I often think of one’s health and nutrition in the same manner. Sometimes, our eating and healthy behavior is “off balance” and we need to get it back into check. At times we are not mindful of what we are entering into our mouths or how it will affect our body’s long term. We put the nutrition of the ones we love and care for every day before our own nutrition. This is being a parent, right!? Maybe, some of us are better at it than others but no matter what we can all use reminders of how to be more mindful to eat healthier. 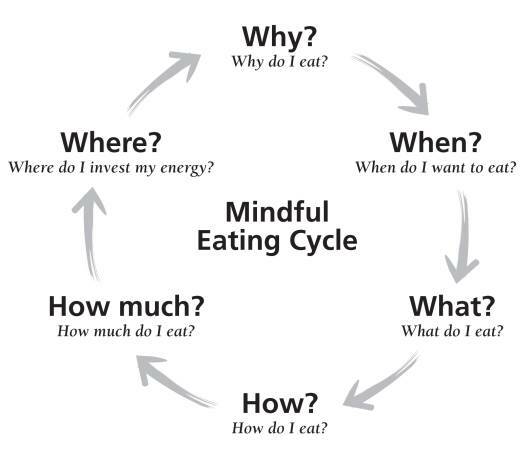 I believe mindful eating is vital to maintaining a healthy weight and eating behaviors. Listen to your body. Slow down. 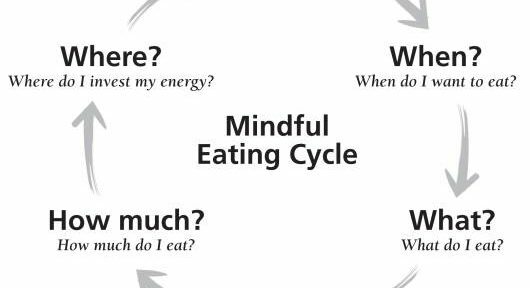 The more mindful we are, the more balance we have around our nutrition and diet. It is especially important to practice around the holidays, celebrations or social events. For example, have you ever actually counted out the number of chips/crackers the label says is a serving? or measured out the appropriate amount of salad dressing or cheese for your salad? This practice encourages more self-education but you also get to visually see what a portion size looks like for that item. Try it for the next food you eat! Learn what normal portions look like for foods. Read those food labels! They have been updated this year and are more reader friendly. This includes even those calorie-dense fluids like juice, Kool aide or, yes, alcohol. I think you will be surprised. Conscious awareness will go a long way in healthy decision making. You may find yourself eating from smaller plates or drinking from thinner glasses. Use mantras to keep you aligned with your goals. 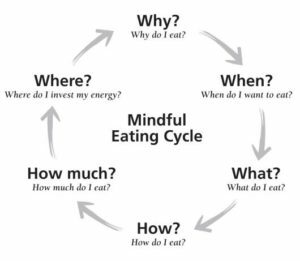 One of the mantras I use to remind myself of mindful eating is: Eat, Drink, Be Mindful. Another contributor to a healthy diet is pre-planning. We are busy people and on the go. If meals and snacks are not planned, it is easy to give in to fast food or limit food groups when grabbing something quick. This can lead to overeating or uncontrolled snacking. Take a few minutes to pack ahead some healthy snacks so you are ready to fuel yourself as well as your family when you hear, “I’m hungry!” from your child in the back seat. Get a dry erase white board and plan your meals out for the week. Incorporate the kids in the process. Taco night or breakfast for dinner can still be offered as a balanced meal. If headed to a party, plan to make a dish that you know has good nutritional value and that your family will eat at the party. I like to think as planning ahead as “mapping out your nutrition” for the day/week. Now, yes, this does take effort but so does getting dressed or maintaining hygiene. If you make it part of your routine, you won’t be bothered by the time it takes. Keep your plate colorful! Try to eat from a variety of colors during your day. Each color represents different phytochemicals, antioxidants and nutrients for your body. They are all important. If you only eat one color all the time, you may be missing out on other vitamins and minerals important to your heart health, the skin or immune system. Be creative with your colors. Try new colors of foods. We have over 10,000 tastes buds and they change often and over time. Repetitive tasting of foods will help one acquire a taste. 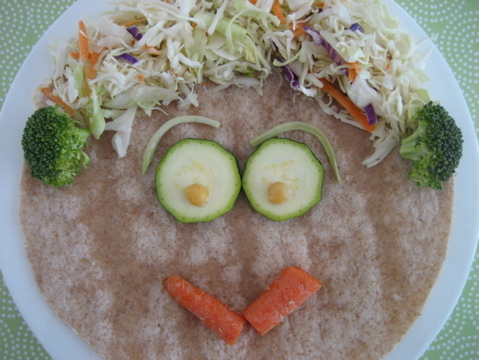 Don’t get frustrated but find different ways to incorporate a new food if your child/ren won’t accept it. Pair protein with each meal and snack! Protein is the building blocks of our bodies. By pairing protein with a carbohydrate or fat, your digestion will be slowed and you will have less spikes in your blood sugar. Try the peanut butter with the apple or banana; add a cheese stick to your crackers; dip sliced peppers or carrots in your hummus or veggie dip; add avocado to your toast; try almonds with your dried fruit. You will have more lasting energy and feel stronger. Choose fruit for dessert if looking for something sweet! This is a nice way to add more nutrients while feeling like you are fixing your craving for sweet. Yogurt and berries, banana bread, mango sorbet can be a lower calorie, higher protein, nutrient-enriched option. I would like to end this blog with Role modeling good healthy behavior. Eat to live, not live to eat! As a heart mom, and a cardiac dietitian, I am endlessly reminded of how precious life is. Be kind to your heart and live as you want your children to live! Yeah, it sounds cheesy but it works. If they see you exercising routinely, packing your lunch for work, making meals as a family, downing a kale smoothie, or trying something new they will follow this learned behavior. Find balance again when you may have fallen off. Be mindful of your body and health and don’t waste time with weight loss pills or quick fixes. Use hard work, education and dedication to help you be successful in maintaining a healthy weight. Megan Horsley is a Clinical Pediatric Registered Dietitian at Cincinnati Children’s Hospital Medical Center. She currently practices in the Critical Cardiac Intensive Care Unit as well as outpatient cardiology areas. She is a Certified Nutrition Support Clinician in addition holds a Certification as a Specialist in Pediatric Nutrition. She received her undergraduate degree from the University of Cincinnati in 2006 and completed her dietetic internship with the University of Northern Colorado in 2007. 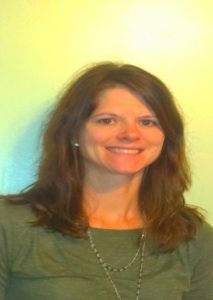 She has been a lead dietitian for the Children’s Heart Institute and participates in many projects and community services such as, The National Pediatric Cardiology Quality Improvement Collaborative, family education day and heart camp to name a few. She recently joined the Cincinnati Children’s Heart Association Board in October of this year. She has ten years of professional practice in pediatric nutrition and thirteen years of personal experience as a heart mom herself. She plans on continuing to concentrate her efforts on improving the nutritional care, experience and outcomes for all children affected by heart disease. With the brand new year, many of us are making resolutions to better ourselves and our lives. Exercising more is often at the top of the list! This week, Kathleen Baschen, an exercise physiologist at Ann & Robert H. Lurie Children’s Hospital of Chicago, shares tips on how patients with CHD can get FITT. Your cardiologist suggests that you start exercising regularly, but where do you start? What type of exercise can an adult with congenital heart disease even do? You can do much more than you think! The key is to start small and build it up gradually as your body adapts. We all have heard the benefits from regular exercise; how it improves lean mass in the body, lowers body fat and reduces stress. But how can it help adults with CHD specifically? It can help decrease shortness of breath and fatigue in day to day tasks, it lowers blood pressure and heart rate and has been shown to reduce hospitalization stays (and duration of stays). The benefits of exercise span from your head to your toes, with having positive effects for most systems in the body. It sounds like a no-brainer, but developing and executing an exercise plan can be hard. Here are some areas that will help you become more FITT, focusing specially on how to incorporate more aerobic, resistance and flexibility exercises into your weekly regiment. Frequency: How often should I exercise? For a beginner, it is recommended to participate in aerobic exercise 3 days out of the week, resistance exercise 1-2 days out of the week and flexibility at least 2 days out of the week. These can be spread out over the week or can be combined into 4-5 days to allow yourself breaks through the week. For example, you could complete aerobic exercise and flexibility on the same day, or resistance and flexibility on the same day. For those who have busy schedules, it can be more time efficient to complete two types of exercise in one day. Intensity: How hard should I be exercising? For patients with CHD, using heart rate during exercise can be inaccurate due to medications or pacemakers. For these patients, it is recommended to use the Borg Scale (see chart below) for aerobic activity. During your warm up and cool down stages, you should be working from 8-10 on the scale (mild intensity). During the bulk of your aerobic exercise, the intensity should increase to 11-14 (moderate intensity). For resistance training, beginners can start with body weight or light hand weights. Increase your resistance every 2-3 weeks to progress strength. When stretching or performing other flexibility exercises, be safe and stretch to a point of feeling a tightness. Time: How long should I exercise for? The ultimate goal is to exercise continuously for 30 minutes. When starting this program, start with any aerobic activity for 10-15 minutes and gradually increase your time over the course of 4-6 weeks. Take breaks when necessary or complete aerobic exercises in an interval format to allow for periods of rest. For resistance training, complete exercises in 10-15 repetitions and 2-3 sets. If you exceed 15 repetitions, it’s time to increase your intensity! When performing flexibility exercises, hold stretches for 10-30 seconds and repeat stretches 2-4 times. Type: What kinds of exercise should I be doing? Whatever you like to do! Aerobic exercises include running, walking, swimming, elliptical, biking, stair master, aerobic classes, Zumba and many more! Resistance training should consist of major muscle groups (upper body, lower body and core). There are countless exercises that you can do right at home with little or no equipment. Flexibility exercise can be anything from traditional static stretching to yoga. Use this FITT principle when you are ready to start your exercise program and make time in your week to complete it. Set a goal and stick to it. Find what you enjoy and do it! Remember to be safe when exercising. Check with your physician prior to starting an exercise plan, and if you ever experience symptoms while exercising, stop immediately or contact your physician if they persist. Kathleen Baschen received her MS from Benedictine University. She is currently an Exercise Physiologist at Ann & Robert H. Lurie Children’s Hospital of Chicago, and her focus is in cardiopulmonary diagnostic testing, pulmonary rehabilitation and cardiac rehabilitation.